Satellite String Networks as well as the following Super String and Quantum String Networks are probably the first actual network design ideas created as a direct influence from String Theory. Indeed, it was the creation of these types of networks that gave way to the realisation that one could rightly class the networks created by the “Baby POP (M⇔Bst) investment principle as strings themselves, albeit, open strings as opposed to closed strings. The advantage of closed strings being the extra level of spin added, as the POP investment principle circles around the string continuously. In general and within networks, the more types of spins, the stronger the network. Satellite String Networks look at the expansion of the original M⇔Bst Baby POP networks. This is a concept far easier to explain with the graphic as seen on the right. (Note: due to M⇔Bst Hierarchal SUSY Entanglement, this figure could reduce to 64). The idea of Satellite Strings came from solving a logistical problem. The Global Network created from Baby POP M⇔Bst strings is destined to contain 32,768 individual networks. Split into eight continental cubes: two in the USA, one in South America, and five covering the rest of the world. 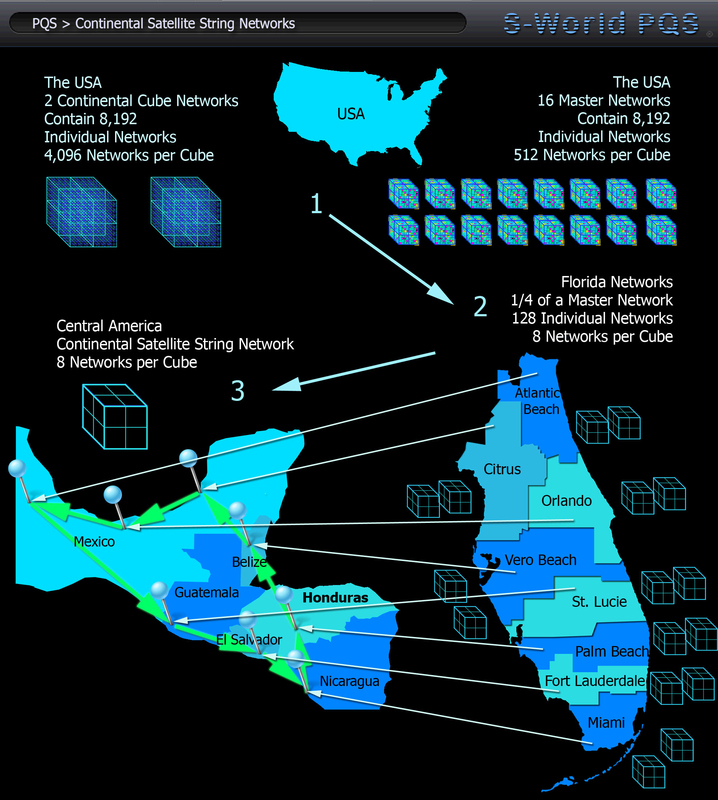 To create balance; Canada, Central America and the Caribbean Islands needed to be attached to the USA cubes. However, the politics of making any such agreements would slow down the procedure. Hence Satellite Strings. The USA would have exclusivity over the 2 continental cubes, where after, it would create Satellite Strings to Canada, Central America and the Caribbean Islands. The process sees all networks in an M⇔Bst string invest “per POP method” into creating a specific Mother Network abroad. This is alongside 7 other network strings doing the same, so creating a collection of 8 continental satellite Mother Networks, where by each new network “POP” invests into the next. However, unlike M⇔Bst strings, the investment would circle not end at the final M⇔Bst string. This being so, an additional level of Spin (capital injection) is added. Alongside “POP” investment from its continental USA network or networks. The closed string would be continually invested into itself. (Note, often one will find different Mother Networks across the USA feeding the same continental satellite network, particularly if it has a valuable resource). It may be simplest to consider M⇔Bst string networks as Open String Networks, and Satellite Networks as Closed Loop Networks as the POP investment flows in a continuous circle. As such if a network should stall (lose money) it is re-energized not only by its USA String or Strings; it is also re-invigorated by its own string.